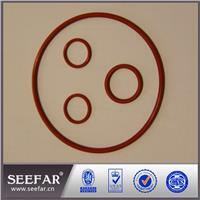 Silicone Rubber Rings are excellent for high temperature in static applications. Outstanding flex and fatigue life, very good for ozone and UV radiation, insulating properties. Send your drawing or requirement details to us, then we will customize for you. 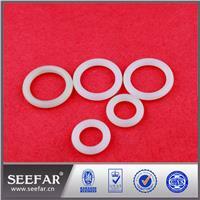 Silicone rubber rings are excellent for high temperature in static applications. Outstanding flex and fatigue life, very good for ozone and UV radiation, insulating properties, and physiologically neutral. Excellent heat and compression resistance, excellent flexibility, good electrical insulator. Excellent resistance to oxygen, ozone and sunlight, animal and vegetable oil and grease. 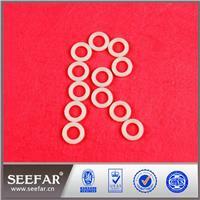 Silicone rubber rings have resistance to fungal and biological attack. Not recommended for dynamic application since it has low strength and poor abrasion resistance & high gas permeability. Not suitable for sealing concentrated solvents, oils, concentrated acids, diluted sodium hydroxide, hydrocarbon based fuels, aromatic mineral oil. alkalis, Superheated water or steam over 120°C. -60°C~260°C Depending on compound and application. Silicone rubber rings are used in many applications and industries throughout the world. The materials we mainly adopt are (3M, DuPont, America), (Daikin, Japan), Lanxess and other branded materials. More than 20 years’ experience, we can design wide range of products and guarantee high quality and favor price. We accept all terms of trade and payment.